This website provides immediate, free information for those seeking better ways to build shelter in disaster-prone areas, especially Haiti and Nepal. Advice and plans from experienced earthbag builders and designers focus on small emergency, transitional and permanent buildings. Why build with earthbags? 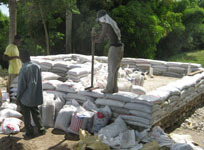 Earthbags (sometimes called sandbags) have long been used for creating strong, protective barriers and for flood control. The same reasons that make them useful for these applications carry over to creating housing. Since the walls are so substantial, they can resist all kinds of severe weather and also stand up to natural calamities such as earthquakes and floods. They can be erected simply and quickly with readily available components and simple hand tools, for very little money. Economics. The basic materials needed for building are often available locally and are not particularly expensive. Sometimes these materials can be found as recycled or salvaged items. The bulk of the material used is the earth itself, which is generally available for free on-site. This means that the cost of building this way can be quite small. An emergency shelter might cost as little as $200 US, and a small home under $1,000 US. Sustainability. Because local soil can be used to build with, the embodied energy in an earthbag structure is minimal. Coupled with the opportunity to use recycled or salvaged materials, the result can be extremely "green." Also, since these structures can be very durable and resistant to natural calamities, they should last a very long time. Cultural sensitivity. One of the wonders of earthbag building is that it can embrace a wide range of building styles, from rounded, organic forms to more conventional rectilinear shapes. This means that it is easy to choose styles that fit any given cultural norm. This can be a tremendous advantage when offering appropriate plans for any particular region of the world. Safety. Earthbag building is a relatively new technique that has received some testing for structural safety. We'd like to see more engineering tests evaluate its performance under a wide range of disaster situations and define the simplest construction details necessary. All of the designs proposed at this website include the safety features that have made other types of earth buildings able to survive hazards like earthquakes and hurricanes. There are many factors which make earthbag building inherently more stable than other earthen techniques, such as adobe. We cannot, however, take any responsibility for the implementation of any specific design since this is beyond our control. Training. There are some people who are experienced in building with earthbags who might be available to directly train and evaluate site conditions and materials. We provided some information about them and how they might be contacted for help or advice. Accessory items or functions that might be desired when developing shelter, such as water catchment cisterns or compost toilets are outlined. Supplies that are needed for this method of building can be found here.